Breast cancer awareness month may have come and almost gone, but there's good reason every season to stay aware and take good care, especially 'round meal-time, says Chef Chuck White, Sheryl Crow's private chef and co-author of thebestselling cookbook,"If It Makes You Healthy." Breast cancer awareness month may have come and almost gone, but there's good reason every season to stay aware and take good care, especially 'round meal-time, says Chef Chuck White, Sheryl Crow's private chef and co-author of the New York Times bestselling cookbook, "If It Makes You Healthy." Crow hired White to spice up her "Eskimo Diet." That's what the Grammy Award-winning rock star calls the brown rice, vegetable and salmon diet she nearly OD'd on after she was diagnosed with breast cancer in 2006. Given the strong correlation between diet and cancer, most breast cancer survivors are invested in eating lean anti-cancer cuisine, but can't necessarily afford a personal chef. 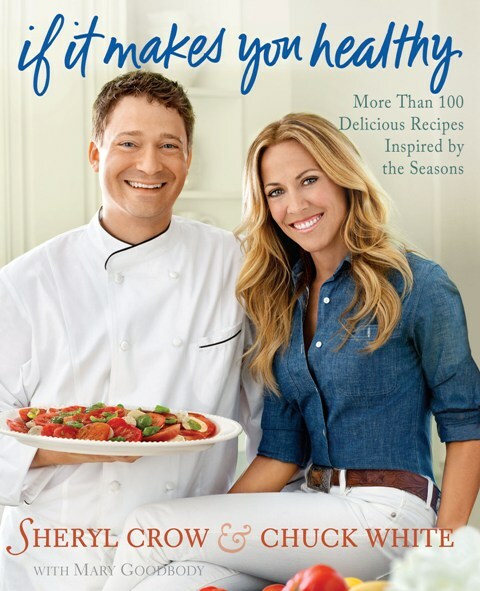 To help breast cancer survivors, as well as those concerned with preventing this all-too common disease, stack the odds in their favor, Crow and White eventually teamed up to bring Chef Chuck's culinary creations from Sheryl's kitchen to every woman's. The slim, blonde rock star may look like the picture of healthy habits, but that wasn't always the case. Before the diagnosis, the itinerant singer-songwriter never went out of her way to eat healthy. In fact, she grew up savoring her mom's finger-lickin' good (read: cholesterol-rich) fried chicken, mashed potatoes and gravy, and never learned to cook. But cancer was a wake-up call to eat better. Crow, a mother herself, quickly realized that, if she ever hoped to improve her family's diet, especially on the road where room service and overcooked catering spreads were de rigueur, she'd need help. When it comes to lip-smacking cooking, word travels fast. Five years ago, when Crow caught wind of White's healthy renditions of traditional dishes from fellow musician and then tour-mate John Mayer, she almost immediately enlisted the Tennessee chef to cook for her back in Nashville, where she lives with her two boys. When I heard of White's recipe for Warm Hummus Soup from the cookbook's publicist, I quickly set up an interview with the five-star restaurant cook turned chef to the stars, then dashed to the market for a can of chickpeas and some organic vegetable stock. If I were going to spread the good word about "If It Makes You Healthy," my enquiring mind first needed to know if at least one of the 125 recipes could make my taste-buds happy. What follows are a handful of questions and answers from my recent long-distance chat with Chef Chuck, plus his quick-and-easy recipe for, you guessed it, Warm Hummus Soup. Q. How'd you go about learning how to do what millions of women with breast cancer must learn to do: cook up an anti-cancer diet? A. If you can stick to good, healthy ingredients, then the rest is pretty easy. I did a little research; I spoke with Sheryl's nutritionist Rachel Beller. But I was already taking traditional dishes and putting a creative, healthy spin on them. That's my trademark: making healthy food fun and exciting. Q. Before you came along, it sounds like Sheryl was resigned to subsisting on an "Eskimo Diet." How'd you go about making her diet not only nutritious, but delicious, too? A. She was eating kinda macrobiotic - brown rice and vegetables - and salmon three times a week. [I was keen on] taking those basic principles, and adding more flavor, more spices with antioxidants (tumeric, cumin), colorful versions of vegetables, (purple potatoes, red cabbage), making healthy meals taste well. Q. You're catering not only to Sheryl's tastes, but her two boys Wyatt and Levi's. How'd you come up with recipes for the whole family? A. They all eat the same thing. Their nanny cooks up something pretty simple for them at home, but when Sheryl's in the studio recording or on tour and has to be at her best, I try to include whole grains, healthy organic protein like chicken tenders, vegetables, fruit... a good balance. It's like throwing darts at the dartboard, I see what sticks. Q. Given that you're somewhat restricted in the ingredients you can use in cooking lean anti-cancer cuisine, how do you keep the menu interesting over time? A. Honestly, I do a lot of research. I'm always eating out, trying new things. I'm constantly reading. I read all the vegetarian magazines. I love Eating Well, Cooking Light and Vegetarian Times. Q. Readers generally coo about your quick and easy recipes, but some complain that they're too time-consuming. What do you have to say to your less than enthusiastic Amazon.com reviewers? A. There are a lot of simple recipes in the book, and a few more in-depth recipes. 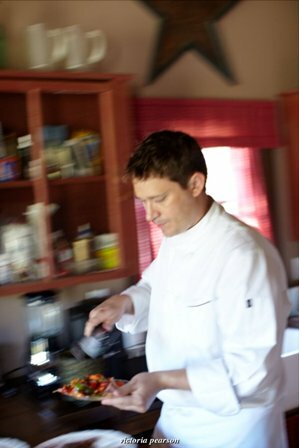 I wanted to show the simplicity of healthy cuisine as well as the complexity. Overall, 70% of the recipes are simple. But if you've got a Saturday afternoon free and you want to tackle a more difficult recipe, you can do that. Q. Because I've written a book about self-compassion and diet, I always ask interview subjects what's self-compassion got to do with it, got to do with your work? A. If you put crap in your body, you'll feel like crap. You'll look like crap. It's harsh, but true. But if you put good things in there, you'll feel great. You'll look great. It's that simple: you are what you eat. You'll be what you eat. Q. What's a quick and easy recipe readers can try at home? A. What comes to mind that is real easy is the Hummus Soup recipe. It uses tumeric, which has been shown to help prevent cancer. It's essentially warm, thinned hummus garnished with pita chips and pesto. 1. In a blender, blend half the stock, half the chickpeas, half of the lemon juice, half of the tahini paste, half of the garlic, and half of the cumin, coriander, and turmeric until smooth, 2 to 3 minutes. If the soup seems too thick, add water or more vegetable stock, 1 tablespoon at a time. Season to taste with salt and pepper. Transfer the first batch of the soup to a large saucepan or pot. 2. Repeat with the remaining half of those ingredients to blend a second batch. 3. When all the soup is blended and in the pot, bring it to a simmer over medium low heat. Stir the soup occasionally during heating. 4. Ladle the soup into shallow bowls and top each serving with 2 or 3 pita chips. Spoon about 1 tablespoon of the pesto on the chips or soup. 1. Preheat the oven to 350°F. Lightly oil 2 large baking sheets. 2. Separate the top of each pita from the bottom, so that each is divided into 2 halves. Transfer the halves to a large mixing bowl and sprinkle with the olive oil, garlic powder, salt, and pepper. Toss well but gently so that each pita triangle is well coated. 3. Lay the pita triangles on the baking sheets in a single layer. Bake for 10 to 12 minutes or until golden brown. 4. Let the pita chips cool on the baking sheets to room temperature. Use immediately or store in a sealed plastic bag or large lidded container for up to 1 week. Having made the soup, I can tell you it is incredibly easy. The hardest part was finding the tumeric. (It's not a spice I use everyday.) What's more, it's nutritious and delicious! But to make my taste-buds perfectly happy, I might add a few dashes of cayenne pepper or try White's alternate garnish -- smoked paprika and plain yogurt -- instead of cilantro pesto. Recipe from If It Makes You Healthy by Sheryl Crow and Chuck White with Mary Goodbody. Copyright © 2011 by the authors and reprinted by permission of St. Martin's Press, LLC. Jean Fain is a Harvard Medical School-affiliated psychotherapist specializing in eating issues, and the author of "The Self-Compassion Diet." For more information, see www.jeanfain.com. Got a thing or two to say about any of the above? Please share in the comments section.